When we talk about “secrets” in video games, we’re not using quite the right word. When people, or cultures, or governments keep secrets, it’s because they’re embarrassed, or afraid, or hoarding a hidden advantage. Our secrets are our shames and weaknesses, and we can forge intimate relationships by sharing them or be rendered painfully vulnerable when they’re taken from us. The point of a secret is that it must not be revealed, and if it were, there would be consequences for whoever was keeping it. A video game secret works the opposite way. They’re things you’re supposed to find, bonuses or rewards for players who poke around. The more word of a game’s cool secrets spreads, the more highly regarded it becomes. Games are coquettish with their secrets, deliberately giving them away but making players think they’re discovering them through their own ingenuity. They’re neat, but they’re a part of the facade, not a look behind it. Team Ico’s Shadow Of The Colossus is mired in secrets. Some of these are harmless, benign obfuscations of facts that are more interesting when left unexplained, like its characters’ motivations. But it also keeps more traditional secrets deliberately out of sight. The setting of Shadow Of The Colossus is a forbidden land, but beyond what is forbidden merely to the main character are lands forbidden even to players. It’s only thanks to the work of in-game explorers—from the earliest tinkerers like WWWArea and Pikol to Nomad’s exhaustive campaign—that we can view these normally inaccessible areas with our own eyes. These are the true secrets of Shadow Of The Colossus, the intimate secrets it genuinely attempts to hide from its players, and like all true secrets, they reveal the game’s deepest shames and compromises. Secrecy is a part of Shadow Of The Colossus at every level. It’s a story about a young man who intrudes on his culture’s Forbidden Lands, witnessing everything his people insist should remain unseen. The world’s backstory is left unexplained, and even the characters’ names are only revealed in the end credits. Video game-style secrets abound too, the biggest being the appropriately named Secret Garden, which can be reached by following a difficult to navigate—but nonetheless deliberately placed—path. The real secrets of Shadow Of The Colossus, the secrets it wants nobody to see, are accessible only through a combination of arcane movement techniques and straight-up hacking into the game. With these methods, explorers have found hidden geography beyond the edges of the world, evidence that the game’s map was once meant to accommodate the 24 colossi director Fumito Ueda originally aimed to create, not just the 16 that appear in the finished game. If you can get there, along the world’s eastern edge you’ll find rolling hills that take up nearly a fifth of the game map. Some of this terrain is jagged and polygonal, like a game environment from 1996, and looks like something made to practice working in the game’s engine or to test its limitations. In other places, the mountains are all but complete, featuring recognizable cliff faces, foot paths, and canyons, such that you can practically see where the order was given to cut the content. Other than an untextured patch to the northwest, which is eerily smooth and plastic-like, these peaks are carpeted with a single beige texture that Nomad has traced to a demo build of the game. Buried in these mountains is the game’s most resplendent hidden jewel, “Pikol’s Dam,” a massive piece of architecture named for its discoverer. It’s the most superficially complete location to be cut from the game, fully modeled but incorporeal due to a lack of collision detection—a ghost world in the truest sense. 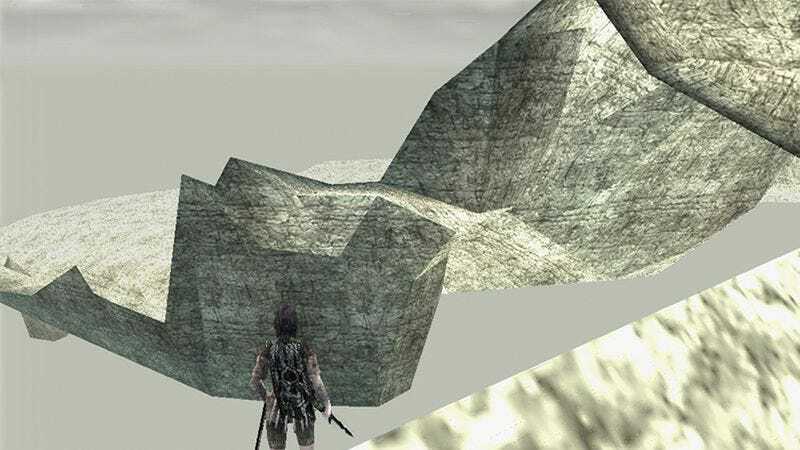 These are the real secrets of Shadow Of The Colossus, and they’re the same sorts of secrets many of us keep: unrealized ambitions, imperfect first drafts, unflattering accidents, and uncorrected mistakes. In an interview with Edge in 2013, Ueda stated “the map in the game is designed to house 16 colossi… It would be a completely different map if we’d included all 24.” But the finished game’s map isn’t “completely different,” merely trimmed and edited, leaving behind considerable scar tissue. One of the director’s only references to this vestigial content comes from the same interview: “There’s certainly leftover test data and half-edited areas, but… I think it holds more romantic appeal if you don’t know the specifics.” Ueda may think that, but secret seekers like Pikol and Nomad clearly disagree—the specifics are exactly what they find romantic and appealing. These explorers have witnessed the game’s most diligently buried secrets, and it’s only strengthened their already considerable fascination. That depth of intimacy and acceptance is called unconditional love when it exists between people. We often talk about our minds as having a space to them. Something you can’t quite remember is “in there somewhere,” and spontaneous ideas are said to come from “off the top of your head.” The things we don’t want people to know about—our secrets, our shames—get “buried” or put in the “back of our mind.” A game space is a bit like that hypothetical mind space, an imaginary world where ideas can be physically explored. But when a game wants to hide something, it doesn’t bury it deep within; it pushes it far without, beyond the invisible boundaries of its world. Far into this normally inaccessible void is where Shadow Of The Colossus hides the parts of itself that are incomplete, that it’s insecure about, that it finds ugly or embarrassing. That we can witness these normally unseen facets, even if only vicariously, allows us to form a deeper connection with an already superb work. That’s a far more interesting secret to discover than some power-up.